How do Partnerships Affect Happiness and Longevity?How do Partnerships Affect Happiness and Longevity? How do Partnerships Affect Happiness and Longevity? In my soon to be published book I discuss the power of partnerships in two important areas of my life: work and personal. CWS was founded in 1969 by Bill Williams and Jim Clayton when they met at Indian Guides and soon discovered they had read the same book on striking it rich in real estate. Their entrepreneurial spirit led them to embark upon a new journey with the help of friends and family to begin a real estate investment firm that took advantage of the burgeoning opportunities in the rapidly growing United States of the 1970s. They soon ventured into investing in manufactured housing communities and Steve Sherwood joined in 1976 to complete the partnership and make it CWS (Clayton, Williams & Sherwood) and catapult the company to become one of the largest owner/operators of manufactured housing communities in the country by the mid-1980s. Their story is a fascinating one and is recounted in the book. I think readers will find it quite compelling. It is a true American success story that carries on to this day. Jim Clayton stepped back from the company in the mid-1980s and that left Steve and Bill at the reins. Steve is 17 years younger than Bill so it was inevitable there would be a time when Bill would want to take a step back as well. This took place in the mid-1990s. Steve’s experience with Bill and Jim was so successful and left such a profound impact on Steve that he has come to believe that it is vitally important for him to manage and grow a business with partners. I was brought into the fold at around the same time as Bill lessened his involvement in the company and Mike Engels completed the new triumvirate in the early 2000s. We all bring very distinct skills (and biases and blind spots) to the table which we hope lessens the probability of making sub-optimal decisions, particularly avoiding catastrophic errors, and capitalizing on game-changing opportunities. We have navigated some turbulent waters together, including the technology downturn of the early 2000s which had a very negative impact on apartments and the challenges that arose from the Great Recession. As Bill Williams likes to say, “Out of the hottest fire, the strongest steel is formed.” We gelled and the CWS team came together in extraordinary ways to allow us to come out of the downturn with our portfolio intact and well positioned to take advantage of the tremendous opportunities to purchase and develop apartment communities as the economy recovered. The power of partnerships has extended to my personal relationship with my wife Roneet. We have always shared a similar view in terms of raising our kids, what’s important to us as a couple and family, and how to invest our time and money. The book discusses some very significant challenges we had to face in terms of our kids and a few personal investment decisions that worked out quite well for us. These were made knowing that we were stretching a bit financially but felt like we had sufficiently looked at the worst case scenarios such that they could be handled. In short, we collectively used our skills to identify the opportunities, assess the risks and potential rewards, and took aggressive action when we were aligned that these were the right decisions to make. I bring all of this up because not only to continue to share some of what’s in the book, but to show how it seems to fit with an interesting study about happiness that I recently read about in this article. It discusses happiness and marriage. First of all, as the following chart shows, the mid-life crisis is a real phenomenon. I think Harley-Davidson sales can attest to this as well. 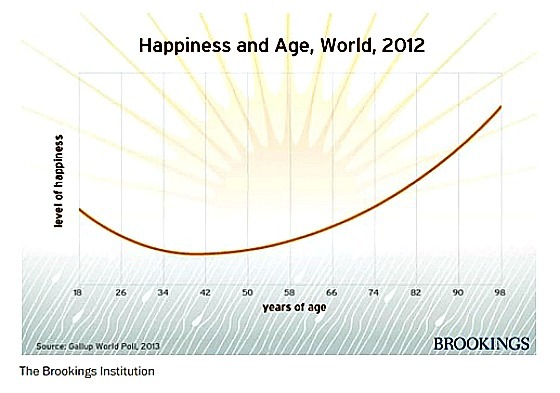 The chart clearly shows how happiness declines quite a bit from about 20 to approximately 50 and then rises quite nicely such that people are on average happier later in life than they were when they were younger and more carefree. So what does marriage have to do with this? 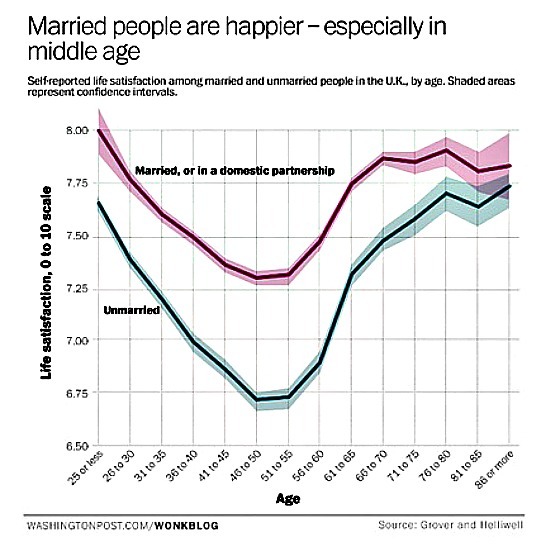 Well, interestingly, while the curve downward is unavoidable on average, it turns out that being in a solid relationship can help make one happier than one who is not as the following chart shows. There is a fairly noticeable gap between those who are married versus unmarried, particularly for those between 30 and 60. With both parties going down in terms of happiness at the same time, it’s easy to think that the other party could be the cause of our unhappiness, when the reality is that it’s a natural progression to less happiness in mid-life. The opportunity is to recognize this and to work together to try to make these some of the most meaningful parts of our lives despite the existential crises, empty nesting, questions of mortality, our bodies not always working the way we want, pressures of supporting our kids and parents in some cases, and the risk of Groundhog Day setting in where every day feels like a repeat of the previous day. If we all knew a train were coming at us but it was a long distance away, then we would make every effort to avoid it. These charts show that meaningful relationships can go a long way to helping us get out of the way rather than laying on the tracks incapacitated. Many studies have shown that people with strong support systems do tend to live longer and happier lives. 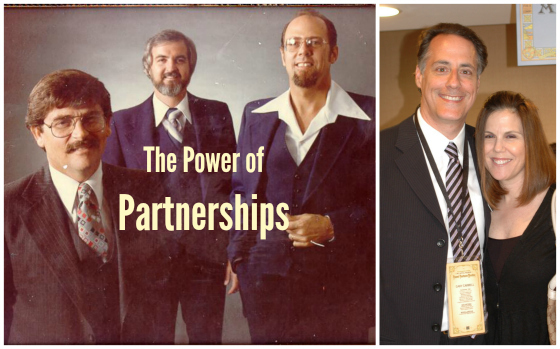 There are truly magical powers in strong partnerships. Now go give someone important in your life a nice hug and tell them how much they mean to you! Do you have strong longstanding partnerships in your life? Are they a combination of personal and professional partnerships? How have they enriched your career and your personal wealth? ‹ Who Is Truly Wealthy? That has impacted me with how I relate to others in my professional career. P.S. This was worth the read (recommended by Ms. Mills on LinkedIn) just for the 70s photo! Hope you are well! Rebecca, how nice it is to hear from you and thank you for taking the time to read my blog and comment about it. It was kind of Sunnie to share my blog article on LinkedIn.